The orphan Lyra Belacqua has grown up at Jordan College in Oxford, though she's no scholar herself, preferring to explore the college grounds with her friend Roger rather than spend her time learning. But her carefree life comes to an end when her guardian Lord Asriel arrives with strange tales from the North about a city suspended in the Aurora Borealis and a mysterious substance called Dust. He removes Lyra from Jordan College and she goes to live with Mrs. Coulter, a scholar and explorer who is very warm and kind towards Lyra. But all is not as it seems, and soon Lyra is going North herself to rescue her kidnapped friend Roger who has been kidnapped, armed only with a strange truth-telling contraption called an alethiometer and accompanied by a group of Gyptians and an armored bear. This is my third time through this series, which I've been wanting to revisit for quite a while. 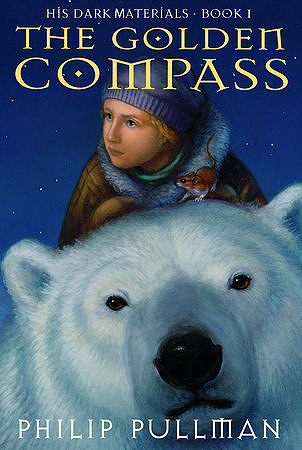 When I heard that Philip Pullman will be releasing a new book this fall in a related series, I knew it was time to go back and listen again. This is one of the first audiobooks I ever listened to, and still one of my favorite. It's narrated by the author and a full cast, and it's just wonderful. As much as I love the story of Lyra's adventures, it's the world-building which has always captivated me about this series. In particular, I love the idea of daemons. In this world, every person has an animal that is connected closely to them, like a part of their soul, and they cannot survive if they are separated. Lyra's is called Pantalaimon and because Lyra has not yet reached puberty, Pantalaimon can change his shape and become whatever animal he wants. But eventually all daemons must settle on a final form. I just love the idea of having a special pet friend who you can talk things over with and who is always with you. In Lyra's world, you're never alone. 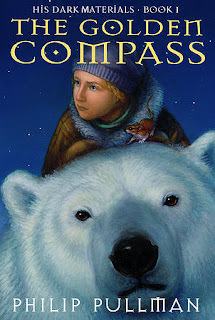 Ever since reading this I've also wanted an alethiometer, the "golden compass" of the title. It's a complex instrument, covered in symbols that each have many meanings. Lyra learns to read it and is able to ask it questions with her mind and then discern the answers by interpreting the symbols the device's hands point to. How can I get one of these? It just seems like it would really come in handy. As is the case with any really great series start, the book ends with more questions than it answers, which of course is the reason to keep going. The reader is introduced to a whole new world and the more we learn, the more we want to know. It's been a long time since I last experienced this series so I only remember bits here and there, so the rest of the story will likely be as much a surprise as it was the first time. I look forward to starting The Subtle Knife very soon!